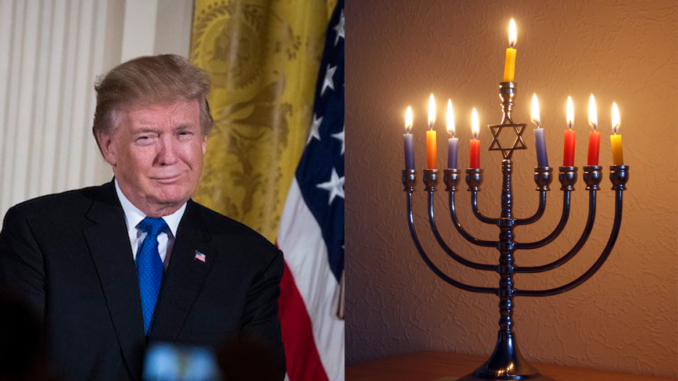 US President Donald Trump celebrated the Jewish holiday of Hanukkah at the White House, only one day after declaring Jerusalem (al-Quds) Israel’s capital and setting off criticism and clashes around the world. Interjected during his speech by applause from a largely Jewish audience, Trump declared that “our world is more full of promise – because of the Jewish people, the state of Israel”. Trump’s comments are expected to promote further anger and discontent to his decision around the world, and appear to reflect the US President’s disregard and defiance to the worldwide condemnations and opposition to his decision. Well, I know for a fact there are a lot of happy people in this room. (Applause.) Jerusalem. I am also proud that my beautiful grandchildren – Arabella, Joseph, and Theodore – have joined us tonight – (applause) – right here as we celebrate with all of you the sacred traditions that they observe each year at home. This evening we gather to celebrate the story that is told in Jewish homes across the country and all over the world, a story that began more than 2,000 years ago with a tyrant – made practicing the Jewish faith punishable by death. He desecrated the Jewish temple, including the ‘Holy of Holies’. But a small band of Jewish patriots rose up, defeated a mighty army, and soon reclaimed their freedom. The miracle of Hanukkah is the miracle of Israel. The descendants of Abraham, Isaac, and Jacob have endured unthinkable persecution and oppression. Today, we are honored to have with us the congregation’s 10th spiritual leader since the American Revolution, Rabbi Soloveichik. (Applause.) That wasn’t bad. You think that’s an easy one? It’s not. (Laughter.) Thank you, Rabbi, very much for being with us. Thank you, thank you for being with us. We’re also – but he’s so happy with yesterday, that he doesn’t care if I get it exact. (Laughter and applause.) Thank you, Rabbi. We’re also deeply honoured that Louise Lawrence-Israëls is here to share this evening with us and to make a few remarks. Louise is a Holocaust survivor. The first three years of her life were spent in hiding in an attic out of Amsterdam, a row house in Amsterdam – amazing story and amazing situation to be in. Her family could not light the candles that we’re about to light this evening, but they lit them in their hearts. We thank God that a woman who was born into that nightmare of oppression now lives in this land of the free, and that she, along with everyone here tonight, can light the menorah for all the world to see. And the world is watching. Today, our nation is stronger, and our world is more full of promise – because of the Jewish people, the state of Israel, and the faith that burns so brightly in your hearts. May you all have — (applause) — thank you, thank you, thank you very much.